All bed size mattresses are made to order and can't be purchased directly from this site. Please let us know your needs and we'll get back to you with a quote, including delivery. You can purchase a cot mattress or basinette mattress from this site directly! Simply click on the relevant link above! Why latex, wool & coco husk in a mattress? What mattresses can be made to order? How do I know what mattress is right for me? This sounds great! What does it cost? I want to know more or place an order? Springs -a perfect breeding ground for bacteria! No person's sleep is the same so we work with the best factory we know of to cater specifically to your needs. Innature makes the highest quality natural beds - they have extremely high standards and are passionate about what they do! Complete the questionnaire if you looking for a Single, King Singe, Double, Queen, King and Super King bed and Innature will contact you to arrange sampling. You can't purchase large bed mattresses from this site directly. Please read below for more information, then complete the short questionnaire. Innature will call you to discuss your needs and arrange for you to sample the range. Please contact us at any time. All mattresses come with a 14 day comfort exchange policy. Each product has a manufacturer's guarantee – please see details on the relevant product pages. The natural features of these fibres, when used to make a bed, provide the optimal sleeping environment for you and your loved ones. See FAQs for more details. Reduces tossing and turning and allows a deeper, more restful sleep. Layer of 100% 500gsm NZ eco wool wadding around the core. All layers are stitched together (no solvents used). Finished with outer casing of 100% Bamboo fabric quilted with 500g/m NZ wool cover with zipper. 7" (175mm) Natural Latex& Wool Mattress. 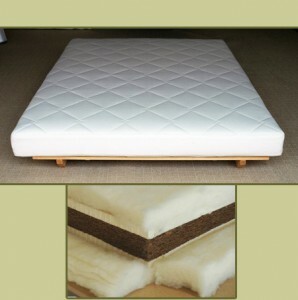 7" (175mm) Soft Natural Latex & Wool Mattress. Is your mattress more than 8 years old? Do you feel comfortable when you sleep on your mattress? Do you wake up feeling all kinds of aches and pain in your body? Do you wake up tired, rather than rejuvenated? Do you suffer any numbness in the shoulder area when you wake up? Do you have trouble getting to sleep because of too much fidgeting in bed? Does your mattress have lumps? Uneven surface? Holes? Torn stitching? Are you becoming more and more allergic? Are you bothered when your partner moves on the bed? If you answered YES to three or more questions, please contact us to discuss your options or complete the questionnaire and Innature will contact you directly! Side sleepers generally need a softer mattress as they have the weight of their hips and shoulders directly on the mattress. This creates a pressure zone which can limit circulation and cause pain and discomfort if a firmer mattress is used. Contact us at any stage if you require assistance. Or complete this short questionnaire and Innature will contact you to discuss your personal requirements. What Happens When We Don’t Sleep Properly? "The best bridge between despair and hope is a good night's sleep."